The secondary system dates back to at least 1937. The Hampton Roads inset shows a couple Virginia Beach SR's, including the infamous SR 615. The main map, however does not show any secondary route numbers. The first official map to show widespread secondary route numbers is the 1938-39 issue. Although these routes are properly termed as state secondary routes, in reality they function as county routes. By this I mean that each county has its own set of numbers. In theory there would be 95 SR 600's. However, with exceedingly few exceptions, SR numbers stay the same when they cross county lines. If you think about it, this took extensive planning on the part of the designers of the system. Imagine all 50 states cooperating to have all state route numbers be the same across all state lines. Now imagine 95 counties doing this. 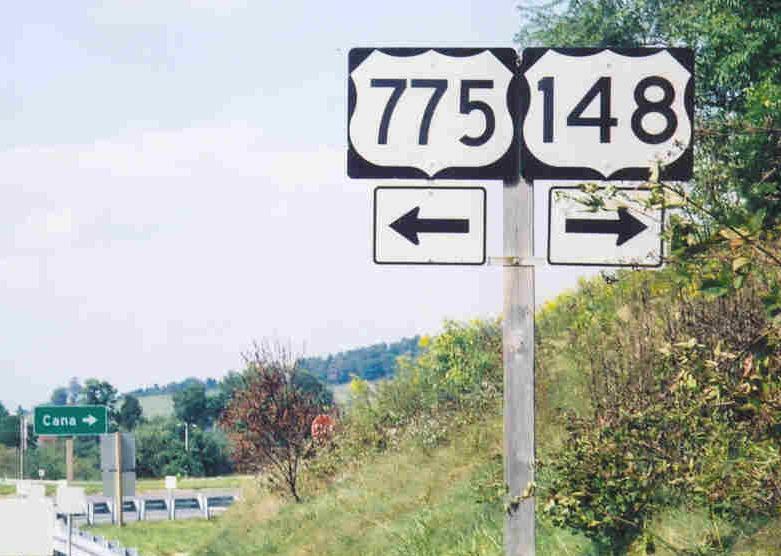 I believe that the secondary route system was conceived before the July 1933 renumbering, and in fact may be its cause, as it made it necessary to eliminate all the state routes numbered 600 or higher (there were at least 94 of these in 1933). I think it took until 1937 to finalize the numbering schemes and get them on maps. Is there any rhyme or reason to the numbering within the counties? There is often clustering where, say, all the 62x routes are near each other. However, this is certainly not a hardfast rule. Additionally, the lower the number does not indicate the relative importance or traffic load of the route. I know of a SR 600 in Northern Virginia that is still not paved and several more that are minor, minor routes with no importance. The lower the number in a general sense can serve as an indication of the age of the road. For instance, many counties' numbers only reached into the 650's or 660's. Thus, SR 695 in a rural county is much more recent than SR 635. In an effort to keep the numbers down, multiplexes (mostly secret) are allowed to let one number continue over not-quite-connecting roads. Subdivisions, Villages, and Incorporated Towns got numbered streets as well. These were clustered and were 4-digit numbers, even if the county hadn't gotten above 700 yet. Each separate place got its own starting number - 1100-1112 for one village, 1200-1207 for the next, etc. Urban counties have soared well beyond 2000 with their routes and no longer resemble clustering so much. Fairfax County has eclipsed 10000, as I have seen 10230 and 10272 posted in white rectangles in the field. The 10272 is currently the highest route number in the country. Check back in a couple months - subdivisions are cropping up left and right. We'll probably hit 11000. Exceptions: Arlington County has never had SR's. Henrico County does not currently have any, but I think their roads were at least numbered on the drawing board, if for no other reason than there are SR 695 reassurance markers at I-295, Exit 51. Independent cities remove SR's within their city limits, except for Suffolk, which continues the Nanesmond County SR system. The fact that Virginia Beach has a few signs left is irrelevant - the SR's there are gone. Incorporated Towns for the most part retain SR numbering, but I know at least a couple that do not: Orange and Dumfries. Chincoteague did but removed them a couple years back. I'm sure there are others out there that do not. Some towns have "T Routes" which are SR's with a T in front of them. I am not sure but I think this designation is related to who is in charge of maintenance and funding. Curiosities: Tangier Island has SR's, probably more SR's than actual cars.